EATING THE SKY vibrates with both dystopic and utopic possibilities, depending upon your worldview or mood of the day. LONG ISLAND CITY, NY.- Socrates Sculpture Park announces the opening of EATING THE SKY by artist John Giorno. Giornos image spans the main entrance to Socrates Sculpture Park from April 13 through July, 2012 and is the new incarnation of Socrates ongoing Broadway Billboard series. EATING THE SKY vibrates with both dystopic and utopic possibilities, depending upon your worldview or mood of the day. The seemingly declarative aphorism defies easy interpretation and toggles somewhere between environmental, existential destruction and spiritual joy and nourishment. Giornos concrete poetry  equal parts visual experience and linguistic force - have been a part of his practice since his first text paintings in 1967. 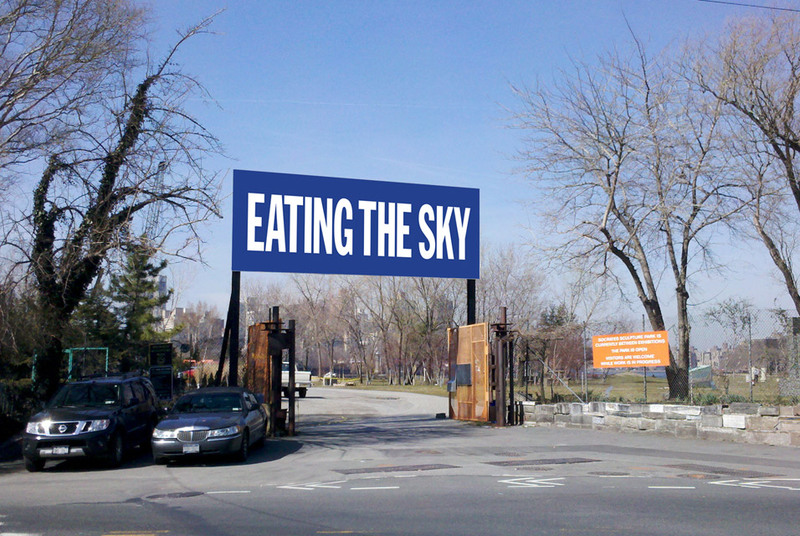 EATING THE SKY originally appeared as the first line in a poem back in 1977, then became the title of a poem, and later evolved into a poetic aphorism and subject of prints, paintings and now a public art project. A denizen of the New York art scene since the 1960s, John Giorno has collaborated throughout his career with mentors, contemporaries and younger artists alike. As a poet, artist, performer, filmmaker, author and spoken word entrepreneur (Dial-A-Poem, Giorno Poetry Systems), Giorno has collaborated and performed with luminaries such as William S. Burroughs, Patti Smith, Andy Warhol, Robert Rauschenberg, Phillip Glass, Laurie Anderson, John Ashbery, Brion Gysin, and countless others. His spiritualism, social and political activism, cross-disciplinary practice and innovation make Giorno an extraordinary artist, influential to a whole new generation of younger artists.